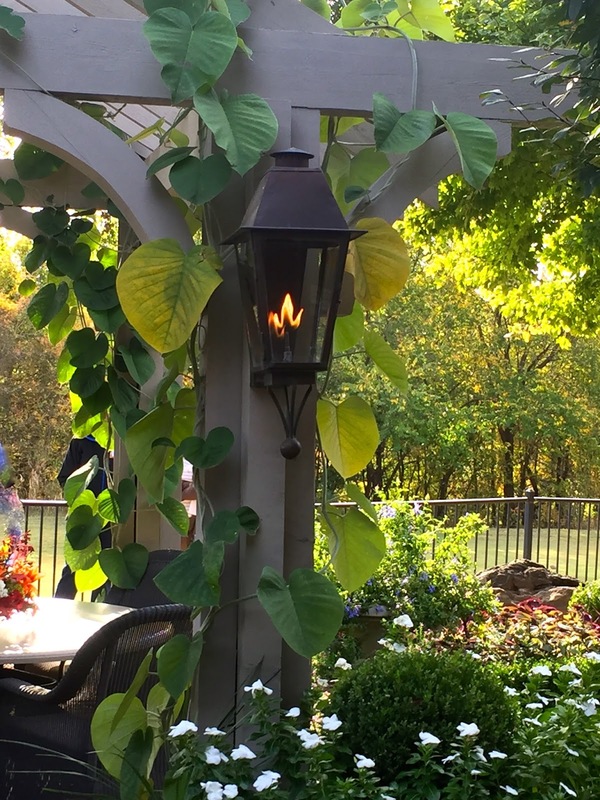 Over several upcoming posts, I'll be sharing some of the great garden design ideas I stole from the recent OHS 2015 Garden Tour last Saturday. After a delightful pre-tour breakfast with the homeowner and the designer (John Fluitt from GARDEN DESIGN ASSOCIATES) of this special garden space, I pleasantly wandered about with my iPhone and snapped some of my favorite design take-aways from this small, but exceptional, garden. 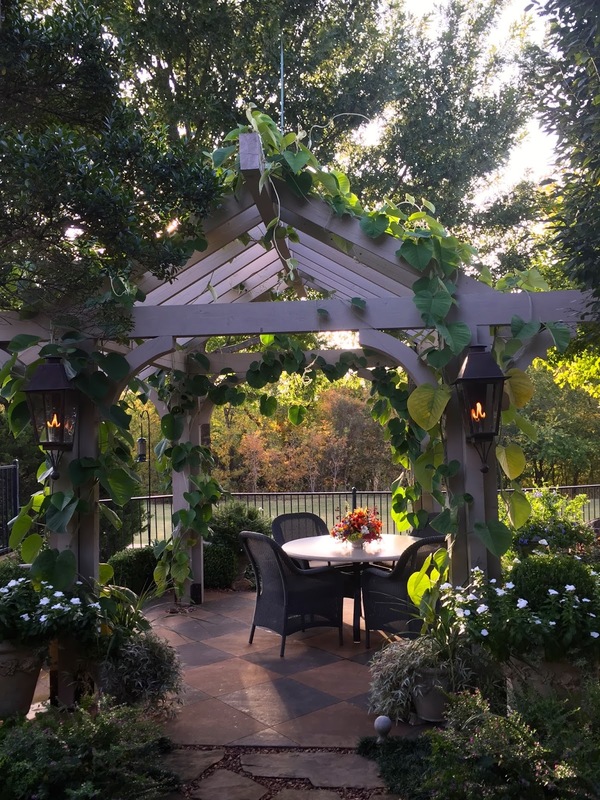 A girl could die happy sipping coffee, or better yet, wine, under the trusses of this fabulous pergola. Built perfectly to scale (perfect use of scale by this designer being a trademark), it is just a few steps from the kitchen into a little bit of garden heaven overlooking an incredible expanse of golf course , winning it my best use of a 'borrowed' landscape award for the day. Let's deconstruct its charm and take note of what ideas I brought home. I adore the lanterns on the front posts...the way their shape mimics and enhances the verticality of the structure, the way they glow, the warmth they imbue, the synergy of beauty they create, their tailored, crisp, yet organic appearance. Everything about them. TAKEAWAY #1 : I need a new larger, more impressive light fixture for my front door. If asked once, the tour attendants were asked a thousand times: "What is that spectacular vine climbing the supports of the structure?" 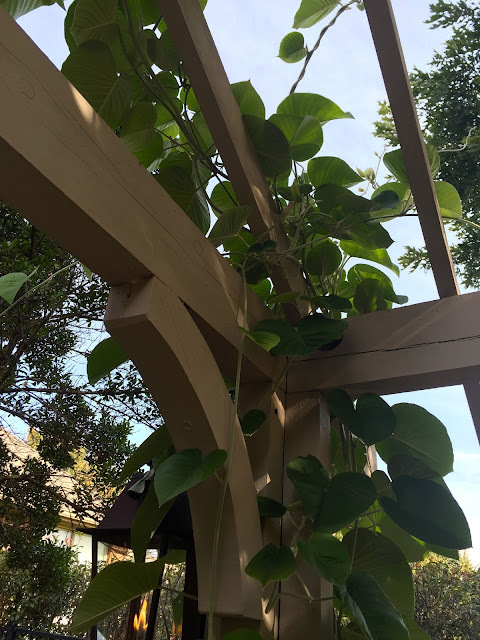 Answer: Wooly Morning Glory Vine, grown as an annual (read more about it from Luis the Plant Geek (here); grow it from seed or cuttings found at Bustani Nursery in Stillwater (here) ), its leaves are mammoth, virtually unblemished in any way. Graphic form and dramatic contrast. 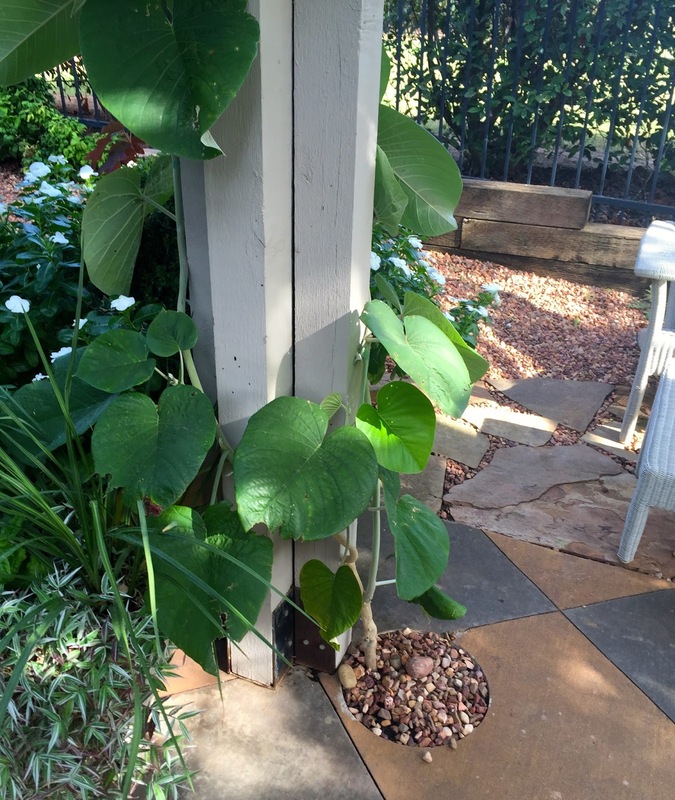 Talk about using a plant in exactly the right way. Heart-shaped form definitely mets function here. TAKEAWAY #2: Think outside the box when it comes to climbers. There's more out there than roses, clematis, wisteria, and trumpet vine! It's amazing what a picture a very common plant can create when used in just the right way. 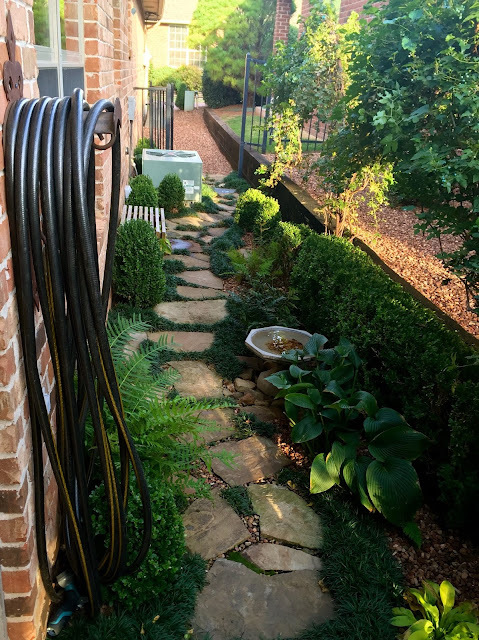 The placement of common liriope, monkey grass, in a circular planting around a small fountain literally glows in the sunlight that cascades down through an opening in the trees. Tough, easy...a very common plant used in a very uncommon way. Brilliant. TAKEAWAY #3: Plant liriope in a difficult-to-grow-anything space off my west side fence...but in a pattern with a central, unobtrusive feature. Striking contrast of green-white-green-green-white mounded forms repeated in an irregular rhythm is so appealing. Crisp definition and movement to please the eye. Round form echoed in the low, ornate round birdbath, nestled in mondo... and continuing the movement of spherical, circular forms throughout the space. TAKEAWAY #3 Surround my own shallow birdbath with mondo grass and other spherical plantings to make it look more 'nestled' and less lonely. TAKEAWAY #4: Love the icy color and habit of this soft Feelin' Blue deodora cedar from Monrovia. I should use it more often as it's a low growing conifer, ideal for containers, rock gardens and tight spaces. I am always on the look-out for tough, good looking combos for summer seasonal color. This marriage of color and textures fits the bill. TAKEAWAY #5: The trio of blue-gray and purple tradescantia (read an article about it (here) with the delicacy of the vigorous Mexican heather (an annual I haven't liked much...until now). A sophisticated contrast of color and texture and reliability that is one handsome marriage of plants. Plan on seeing a lot of it in my front beds next summer. What a brilliant design for a narrow, side-yard space. We all have one. :) Feel free to steal the idea. If you have time, watch LC and me tomorrow at 4:30 on 4 YOUR GARDEN on NewsChannel 4. Hope to see you then!